Our 148-bed treatment center offers many high-quality features and amenities that we hope will make your recovery a more fulfilling and enjoyable experience. 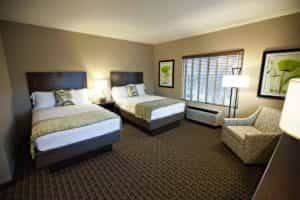 At Desert Hope, we do everything we can to make your stay as comfortable as possible. Our hotel-style rooms with full-sized beds, private bathrooms, a maximum of 2 patients per room, plus housekeeping services will keep you feeling relaxed enough to focus on your treatment and not your surroundings. We also have separate floors for men and women to increase your privacy and sense of security in our program. Gourmet meals – Substance abuse often leads to poor nutrition. We can help you rectify this with nutritious meals prepared by a 4-star chef who can accommodate special dietary needs. Daily and weekly menus are posted outside our cafeteria so you can plan and look forward to your favorite meals. Indoor fitness center – Working out helps you feel better physically and emotionally. Our private fitness center offers a variety of exercise equipment and machines including treadmills, ellipticals, a punching bag, and more. Onsite laundry facilities – Men and women have their own separate laundry facilities where they can wash and dry their clothing and personal items. Biofeedback chair – Biofeedback therapy uses relaxation exercises and techniques to calm you and offer relief if you feel stressed, anxious, angry, overwhelmed, frustrated, and restless during recovery. Biofeedback can also help you manage certain withdrawal symptoms, such as drug and alcohol cravings. Art room – Our art therapy room allows you to draw, paint, and use other forms of art when you need an outlet or want to express your feelings and frustrations as you make your way through recovery. Music room – Our cozy music room features a grand piano that can be played by guests and patients. Library – A small library provides patients with a large, diverse selection of books they can borrow to read during their spare time throughout recovery. 12-step walk – A meditative walk representing the journey of recovery from addiction. Relaxing outdoor patios – We offer two beautiful outdoor pavilions where you can read, journal, relax, or nap with the backdrop of soothing water fountains. Trees and lots of lush greenery offer a Zen-like experience for those who want to surround themselves with nature. Women and men have separate private patio areas; smoking is prohibited.